There are many scalp conditions that effect afro hair patients, please see below the most commonly seen at Sussex Trichology. This is an inflammatory condition, which can feel incredibly itchy but not always, the patient often complains the hair looks or feels lank, with afro hair that it looks dull. It is found in the areas where the sebaceous glands are present. The affected area can look inflamed with the skin appearing red. It can be found in the eyebrow region and extend onto the forehead. Patients who complain of this condition notice powder like scales on their shoulders. Contrary to belief, this is not a “dry scalp” problem but actually due to an increase of oil- or rather the content of the sebum that is naturally produced changing. At Sussex Trichology, we advise against the rubbing in of oil, particularly in black hair. Despite many African patients having a strong habit formed, whereby oil is applied every day to the scalp and hair line. We can advise you on the best afro hair treatment, the type of situations that can cause Seborrhoea Eczema and a scalp that is oily are: changes in the hormone levels (menstrual cycle, contraceptive pill or HRT commence or cessation), certain topically used products: so often in black hair care salons, relaxing chemicals can cause irritation or cause this condition, medication taken or being unwell. The patient who consults a Trichologist with this complaint would often describe that the scalp feels sore, and can be really itchy. Closer examination would show inflammation of the scalp and around the affected hair follicles. 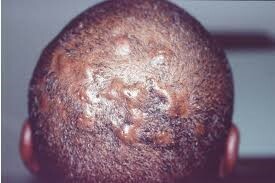 This condition can come and go and the sufferer may notice several small pustules near to the affected follicles. Folliculitis can cause intense itching and tenderness, but the patient is advised to not scratch as this can result in your hair being shed prematurely. 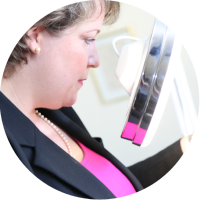 At Sussex Trichology, Shuna Hammocks and her team will treat your scalp in the clinic and guide you on which of the prescription medicated products suit your condition best for home use. Shuna has a vast degree of experience with this condition in afro hair men and women and will gently guide you how best to treat, usually without prescription medication. This may come in the form of various creams, shampoos or lotions, in extreme cases antibiotics may be required. Black patients who present with this condition often describe the feeling of “thickened crust” to the scalp which feels sore and “as if wearing a cap on the scalp”. The appearance is of inflammation and white or yellow scales of skin cells which may be in patches or in extreme cases affecting the entire scalp tissue. The actual definition of Psoriasis is: “patches of adherent thick scales”. The underlying skin is often boggy and inflamed and can even have open infected areas (as patients often pick or scratch away the scales). The reason this condition acts as it does is that the skin cell turnover is too fast, it is NOT due to having dry skin at all! The overproduction of skin serves to protect the inflammation of the skin below. There is often some hair fall when this condition is particularly severe, but this is a temporary state and as the condition improves so too does the return of the hair growth. While this condition is often chronic, it is possible to treat at Sussex Trichology. Clear instructions will be given for home treatment also, but again hydra cortisone is completely unnecessary! When the skin cell turnover is decreased the condition can be kept under control.